What does it mean to be apprehended by Christ? 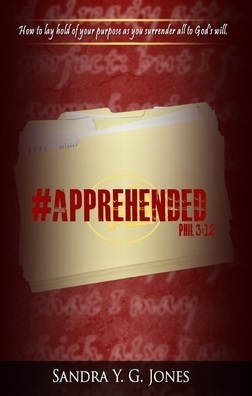 #Apprehended is a fascinating and encouraging read for anyone desiring a closer walk with the Lord, based on a seldom-preached verse from scripture with a life-changing impact for those who truly grasp and apply its meaning. I loved the author’s unique perspective and analogies that really drive her points home. Each section of the book is full of powerful scriptures that will help you grow in your faith and ability to apply God’s word to your life. I especially appreciated the section on having an apprehended tongue, with a strong focus on the words we speak and the importance of speaking in alignment and agreement with God’s word (very powerful!). The one area that left me a little unclear as to the author’s point was the section on image, dealing with Samuel, King Saul, and King David in 1 Kings. To me, it was a bit confusing, and as someone who’s very ardent in my belief of Biblical inerrancy, my impression of the point was such that it was a bit concerning to me, and I wish that the author had perhaps spent a bit more time explaining her point of view. Overall, #Apprehended is a very encouraging and edifying read for believers, perfect for those who are feeling “stuck” in routine and are longing for a closer walk with the Lord. A wonderful book to challenge and inspire! Sandra Y. G. Jones has been in ministry for thirty years, ten of which she has been the pastor of Path Church Of Restoration & Deliverance in Adel, GA. Credentialed by the Joint College of African-American Pentecostal Bishops, she has served as the National Overseer for Rhema Fellowship of Pastors, of Georgia, and currently serves as the National Chief of Staff for the Eagles’ Landing Summit, an organization dedicated to ministering healing to wounded leaders, under Bishop Darryl Dion Woodson. A renown revivalist, Sandra has traveled extensively spreading the Gospel of Jesus Christ, motivating youth, and building leaders. Sandra received her Bachelor of Arts degree in Sociology and Anthropology as well as a Bachelor of Arts in Philosophy and Religious Studies, and is currently pursuing her Masters in both disciplines. She has received certification in critical incident intervention for first responders with an emphasis on suicide and line of duty death intervention from the International Critical Incident Stress Foundation (ICISF), and Georgia Critical Incident Stress Foundation (GCISF). Sandra is also certified in pastoral crisis intervention in both individual and group crisis intervention.